In November 2015, I delivered a TED talk at TEDxVanderbiltUniversity. I spoke about my nine years reporting on veterans' issues and the disturbing cases I uncovered of wounded soldiers who are being denied disability benefits. To watch my TED talk, click here. 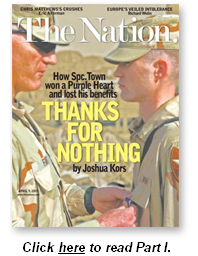 In April The Nation ran my article on how the U.S. Army tortured Sgt. Chuck Luther. A few months later Congress launched its own investigation. On September 15 the House Committee on Veterans' Affairs held hearings on Luther's case. I was called to testify, as was Sgt. Luther and a panel of high-ranking Army officials. To watch a clip from the torture hearings, click here. The torture hearings, investigating Sgt. Luther's case, proved highly explosive and attracted international attention, including this piece from RT Television. To watch the RT piece, click here. On Veterans Day I appeared on "GRITtv," a news talk program on the Manhattan Neighborhood Network (MNN), to discuss the recent torture hearings. The show, hosted by Laura Flanders, also included commentary from Margaret Stevens, a veteran of the New Jersey National Guard and professor of history at Essex County College, who spoke about the challenges facing female soldiers. To watch the Veterans Day show, click here. It was my second appearance on "GRITtv." On Memorial Day Flanders invited me to discuss PTSD and veterans' suicides. That show featured video and commentary from Dan Lohaus, whose documentary about homeless Iraq vets, "When I Came Home," was honored at the Tribeca Film Festival. Also featured in the clip is Iraq vet Darren Subarton, who talks about his struggles with PTSD. On Dec. 27, 2009, Subarton was found dead at his parents' house in Pennsylvania. He leaves behind a wife and young son. To watch the Memorial Day show, click here. Recently ABC News Radio, San Francisco (KGO) invited me to discuss Sgt. Luther's torture. The host, Ronn Owens, drew strong reactions from listeners, as he played clips from the Congressional hearings sparked by my reporting. It was my second appearance on Owens' program. In May the host invited me to discuss the personality disorder scandal and Iraq and Afghanistan soldiers' struggle for benefits. I also made a brief appearance on Owens' show on Veterans Day to talk about the newly released video of the torture hearings and discuss what all of us can do to honor our soldiers. 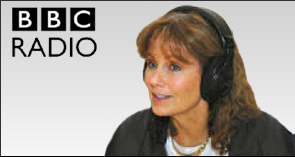 To listen to the recent ABC News Radio interview, click here. To listen to the earlier interview, click here. And to hear my Veterans Day appearance, click here. Following the torture hearings, I appeared on the popular San Francisco radio program "Wake Up, Everybody." Host Donald Lacy and I discussed the dramatic twists of the Congressional hearing, including Sgt. Luther's graphic account of his own torture and Congressman Steve Buyer's storming out of the room in the middle of Luther's testimony. To listen to the KPOO interview, click here. In May the BBC, in coordination with Public Radio International (PRI), ran three stories about Sgt. Chuck Luther and the personality disorder scandal. The first piece aired on "Here and Now," hosted by Robin Young. Young interviewed both me and Sgt. Luther. To hear the interview, click here. Host Marco Werman picked up the story, interviewing me for his program, "The World." Four days later he spoke with Senator Kit Bond. 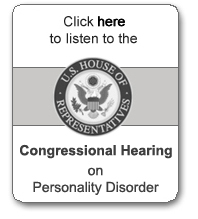 Bond had co-authored a bill with then-Senator Obama to halt personality disorder discharges. 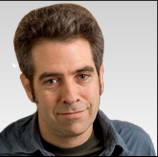 To hear Werman's interview with me, click here. To hear his interview with Sen. Bond, click here. In May 2007 I began working with Bob Woodruff of ABC News to turn my reporting on the personality disorder scandal into a piece for "Nightline." Our report aired July 12. To watch it, click here. To read a text version of our report, click here. A shorter version of our report aired July 12 on "World News Tonight with Charles Gibson." To watch it, click here. 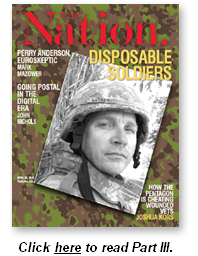 The text version of our report contains a slideshow of soldiers diagnosed with personality disorder. To view it, click here. invited me on several times to discuss the personality disorder scandal. The day after our "Nightline" report aired I appeared on the afternoon news program with host Jim Bohannon. To hear our interview, click here. In it, an Iraq veteran suffering from PTSD is left homeless after being cheated out of his benefits due to a diagnosis of personality disorder. Matthews has discussed my reporting on Specialist Jon Town throughout his recent tour, first on at the University of Massachusetts, then the following day at Radio City Music Hall. Matthews' comments at Radio City are featured on his new CD/DVD, "Live at Radio City Music Hall." 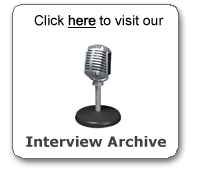 To listen to his comments at Radio City, click here. To hear his comments at the Amherst concert, click here. 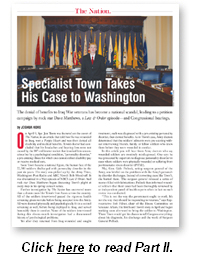 In June, Matthews posted a petition on his website, asking the Secretary of Defense to investigate the personality disorder scandal and requesting that Congress hold hearings on the issue, to hear the story directly from the soldiers themselves. In early July, Matthews sat down with ABC News' Bob Woodruff to discuss the personality disorder issue for "Nightline." To watch Matthews' interview, click here. On July 15, George Stephanopoulos, host of the ABC News' "This Week," highlighted Dave Matthews' comments about personality disorder in his weekly "Voices" segment. To watch the Matthews segment, click here. On July 25, I appeared on CNN's "Paula Zahn Now" to discuss my military reporting. The show highlighted the story of Jeans Cruz, a soldier who helped capture Saddam Hussein. Cruz returned from Iraq with PTSD and was then denied all benefits after he was diagnosed with a personality disorder. The segment featured commentary from Andrew Pogany, an investigator for Veterans for America who has been looking into personality disorder for two years. To watch the CNN segment, click here. On December 20, CBS News correspondent Kimberly Dozier reported the story of Spc. Shawn Saunders, who was traumatized during his third tour in Iraq. Saunders watched his best friend die while on duty, returned home suicidal, and was diagnosed with PTSD. But Saunders' commander ordered the diagnosis be changed to "personality disorder." 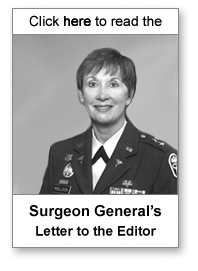 The soldier was then discharged and denied medical care. Dozier details the personality disorder problem in her "Reporter's Notebook," which includes her interview with me.